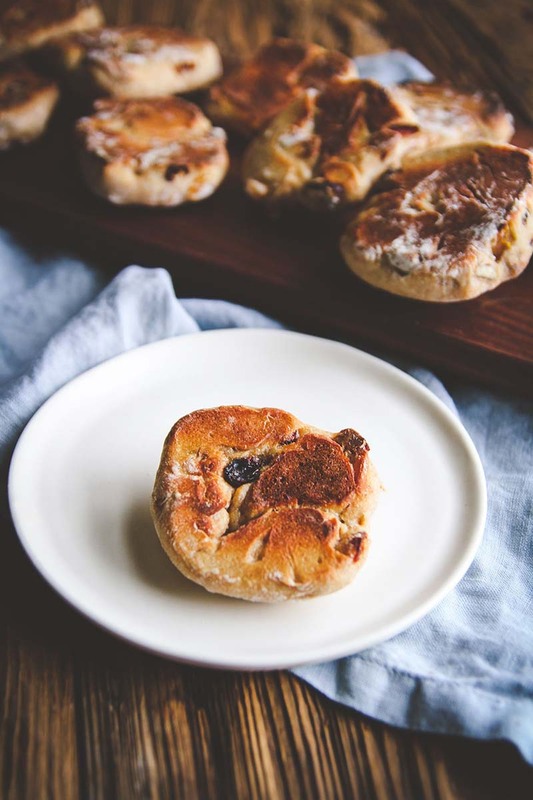 Filled with wholesome ingredients, these fruit and nut muesli bread rounds are perfect for a healthy snack recipe. Combine warm water, yeast, salt, honey and oats in a large bowl, stir to combine, and allow to rest for 5-10 minutes, until the mixture is foamy. Slowly stir in the all-purpose flour and whole wheat flour and mix until dough just begins to form. You can do this using a stand mixer with a dough hook attachment set on low, or by hand with a wooden spoon. Add in the chopped dried fruit, nuts and seeds and stir a few times. Turn dough onto a floured surface and knead for 5-8 minutes, until the fruit, nuts and seeds have really been incorporated into the dough, and the dough is soft and elastic. Place the dough into an oiled bowl, turn to cover all sides of dough with oil, cover with a clean kitchen towel or plastic wrap and allow to rise for an hour. Turn the dough onto a floured surface and roll/shape into a large rectangle (about 18x12-inches). Using a pizza cutter or a knife, cut the dough into 18-21 squares. Form the squares into balls, then place on the prepared baking sheets. Flatten balls to make the rounds. When all the dough has been made into rounds and on the baking sheets, cover the baking sheets with plastic wrap or towel and allow to rise until indentation remains after lightly touching with finger, about one hour. Preheat oven to 375°F. Remove plastic wrap or towel from the baking sheets, and bake the bread rounds for 15 minutes, or until the bottoms are slightly golden brown. Remove from oven and allow to cool on wire rack before serving. These bread rounds freeze/defrost really well. To freeze them simply allow the bread rounds to cool completely, then store in a freezer storage bag. When ready to enjoy, remove a round from the freezer and allow it to come to defrost on the counter, or microwave for 30 seconds.